Some people seem to process information over a long period of time, while others process what they see and hear rather instantly. This doesn’t mean one way is superior, since things can get left out with both ways of processing information. The way you process what you see and absorb is a big part of who you are, it also helps you to understand things on your own level. 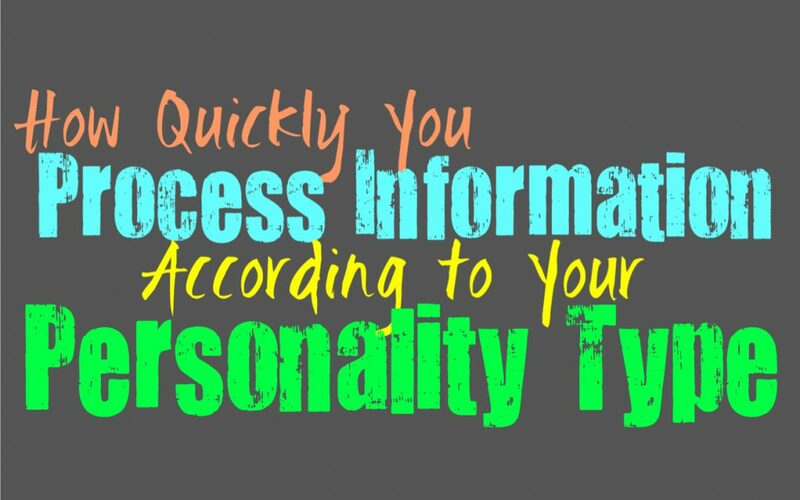 Here is how quickly you process information, based on your personality type. When it comes to new information INFJs actually do need some time to process this and filter it through their internal thoughts and intuition. That does not make INFJs slow learners or slow to respond, it just means in order to fully absorb the information they need time to truly process it. This is part of why INFJs need so much time alone, in order to sift through everything they have learned and uncovered. This actually helps the INFJ reach a deeper understanding of the information, and is how their intuition often uncovers predictions about the future. ENFJs process information both instantly and also gradually, which is sometimes that confuses most people. They recognize what they see but need to subconsciously filter things over a period of time in order to really uncover everything they have learned. This does not make ENFJs slow learners at all, it just means they need time to really process this information in order to understand it on a much deeper level. This is why ENFJs are often so good at predicting the outcomes of certain situations, since their intuition takes the time to process everything and really uncover the truth behind it. INFPs often process things fairly quickly, but that is because they filter everything through their sense of morals. Their emotions are something they have a strong grasp on and so it doesn’t take a lot of time for them to uncover how they should respond to this information they uncover. While INFPs can process certain things rather quickly through their system of morals, that doesn’t mean they don’t enjoy taking the time to analyze things later on. ENFPs do process things rather quickly most of the time, especially when it comes to new information. They enjoy soaking it all in and can often respond quickly to what they uncover. ENFPs are eager to explore new things and sometimes their ability to process quickly causes them to bounce from one thing to the next, since they become bored of what they have experienced. While they do process information rather quickly, that doesn’t mean they won’t take time to analyze things later one. While INTJs are intellectual and often intelligent people, they do prefer to take time to process things. When new information comes their way the INTJ doesn’t simply accept it and move on, they often need time to really dive into what is in front of them. INTJs need time to process information, and often filter it through their powerful intuition. It takes time for them to really process everything so that they can understand it on a much deeper level. For INTJs it is valuable to take this time, which is another reason why they want to be alone so often. ENTJs try to respond rather quickly and sharply to things, but that doesn’t mean they don’t always take time to process every detail. ENTJs do need time to really uncover the more intricate parts of the information they learn, especially when it comes to new things they haven’t fully experienced just yet. ENTJs don’t like processing things too quickly, since this often causes them to miss the more important pieces of information. The ENTJs ability to think on their feet is simply something that comes from facts they have learned, as well as their intuition spitting out answers from what it is has already processed. But ENTJs do often need to process new information at a different pace. INTPs do often process information rather quickly, but they take plenty of time to analyze it and dig deeper. They can process things initially and will easily comprehend what they have discovered, but INTPs don’t just accept this information right away. They need time to analyze it and compare it other information they have already uncovered. For them it takes time to really decipher the many different patterns in order to come to conclusions that are new and valuable. ENTPs process information rather quickly, constantly taking in everything from the world around them. They absorb what they see and discover so much all at once, which definitely makes their processing speed rather fast. For ENTPs there is more to uncover things than just how quickly they can process and understand. They also need to take time to really dig deeper and analyze every detail, so that they can come to more unique and unexpected conclusions. ISTJs do sometimes take their time processing new information, so that this can become more permanent in their minds. They are capable of comprehending things rather quickly, but they take longer to really memorize and understand it on a deeper level. ISTJs often prefer to process things at their own pace, since this helps them to really understand and utilize their minds in an optimum manner. ISTJs simply want to compare this new information to what they have learned in past, and uncover ways to make it useful to them. ESTJs are capable of understanding things quickly, but only information that they can easily connect to what they already know. When it comes to processing new information ESTJs often want to take time to really understand it, instead of just absorb in a way that isn’t going to be completely useful for them. While ESTJs do value getting things done, they also need to take time to really process and understand things in order to be as efficient as possible when the times comes. ISFJs often prefer taking their time to really process things, instead of having to absorb it instantly. Unless it is something pertaining to their loved ones, ISFJs do prefer to take their time to really process things. ISFJs need to take their time processing information in order to understand and really be capable of remembering every detail. While they are capable of really understanding new information, it requires time for them to fully understand every little detail the way they want to. ESFJs often need to take time to fully process new information, since they are more drawn to things they already know and understand. When sometimes new comes their way the ESFJ needs time to process it fully and try to compare it to things they know from the past. While they are certainly capable of processing new information, they just want to have time to fully understand it in a way that will last and help them be more efficient. ISTPs often process new information rather quickly, but they process it differently than most people. ISTPs are connected to the physical world, and so they are often processing everything they see and hear on the surface. They analyze information based on obvious facts, instead of looking into the many layers that might be there. ISTPs do however process rather quickly and can understand and observe things faster than most people. ESTPs definitely process things rather quickly, but they process what they view instantly rather than diving into the details. ESTPs are good at picking up on what they see and hear in that moment, and are skilled at experiencing everything in the world around them. ESTPs process information quickly, but hey only process the information that is factual and evident. For them it would take time to develop new ideas and really analyze things on a deeper level. ISFPs process things quickly and often filter it through their inner emotions and strong sense of morals. They often have a strong grasp on who they are and what they believe, and so everything they observe gets filter through this. ISFPs can pick up on the things around them and comprehend rather quickly what they see. For them it is more about taking things as they are, instead of wasting time and energy really diving into the layers. ESFPs process information rather quickly and can pick up on what they see around them. They are good at observing what they see and will pick up on even the slightest of changes. ESFPs are alert people who are capable of taking in information and understanding what they see rather quickly. They are good at absorbing information and will take things for what they are. ESFPs definitely process information quickly, but they don’t necessary see much deeper than the obvious.